Off body concealed carry is the term most often associated with any portable holster or system that secures the firearm but isn't directly attached to the body. Over the last ten years it has been my own observation that off body carry holsters are gaining popularity and momentum particularly with the rise in the number of women entering the world of firearm related defense. I do know people who primarily use an off body carry system and do it well, but the challenges are great and in my experience off body carry options should be considered a last resort after exhausting all other options. Here is an overview of some of my thoughts on the idea. While the concealed carry purses do seem to be the most common and popular of all the off body carry systems they are not the only systems that fall into the category. There are also backpacks, iPad cases, briefcases and a variety of other objects that look to be normal and casual that in fact have been manufactured or designed to hold a firearm. Is That System Really a 24/7 Solution? Do you plan on wearing/carrying that around the house with you as well? I just don't know anyone who can honestly tell me they keep their purse or backpack on them as they walk around the house in the evening after work. There are also a number of times when the gun owner might be tempted to leave the gun along with it's bag/purse in the car to run into the gas station really quick or to visit the restroom at the restaurant. If using an on-body concealed carry holster, the gun owner would not be vulnerable in those moments but the off-body carrier is. So inevitably the gun owner either has to accept the fact that they will be without their firearm a lot of the time or they have to switch back and forth between off body and on-body systems as they enter and leave certain environments. Can You Draw The Same Every Time? Another significant challenge of off body carry systems is the tendency for that system to be in a different position relative to the body in any given moment. When you enter a life threatening situation your ability to think and make deliberate decisions along with physical movements is greatly diminished. As such your body always reverts back to the most instinctive and practiced mode of movement and thinking. Building that kind of muscle memory is very difficult when the firearm is in a slightly different location on the body from moment to moment depending on how the user is carrying the holster system that day. I carry a backpack (5.11 Covert 18) to our office everyday. It has my laptop, favorite headphones, etc. When I get home in the evening what do you think is the first thing I do when I come through the door? I can promise it is the exact same thing that my wife does with her purse. Set it down. Not a big deal when it only contains a laptop, wallet, or the like. A gun? That becomes a problem because the firearm is no longer in my direct control or in my direct access should there be an emergency at the home. Do you honestly think you are going to walk around the home carrying that holster system during the evening? If not you better be prepared to either switch to a different holster system when you hit the house or consider a different carry configuration all together. Also consider what you do with that “carry system” when you are in the car, at a restaurant, at work, etc. Is it always in your control? It has been my own observation that off body carry systems like purses are more likely to be out of reach when the threat arises. 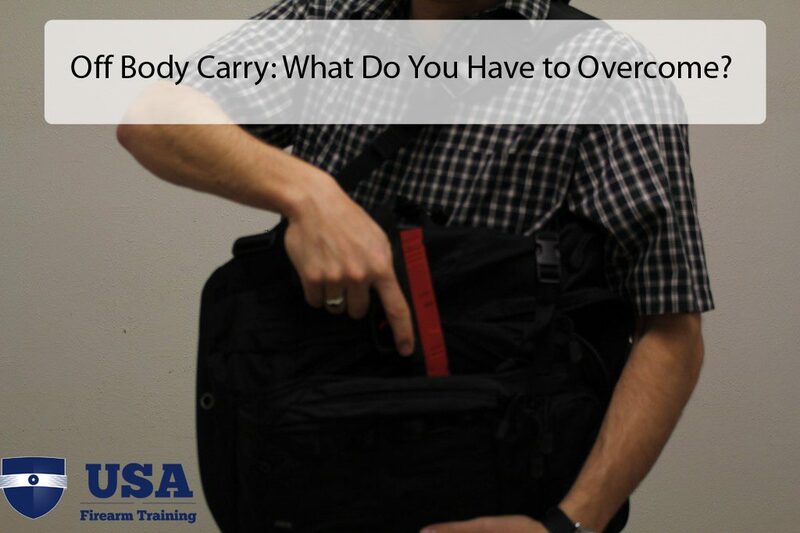 I urge my students to consider off body carry systems as a last resort. That doesn't mean that it can't be done or done well but only that there seems to be more barriers to carrying off body well than there are for any of the other common concealed carry systems. What I want to know, is how you carry your gun. Is it on body? Off body? Let us know in the comments what your preferred method of carrying a concealed gun is. Also we talk about muscle memory a lot. One thing that may be beneficial for your gun training, is if you listened to our podcast dedicated to muscle memory. It may point out some things you never thought about while training. Really glad you wrote this article. Very important topic that should be discussed. Thank you! I agree that using those types of carry rigs should be last resort. I do understand that females carrying like this with a purse or maybe if your a regular motorcycle rider you would as well. But if you do decide to carry a concealed firearm in this manner than you need to regularly train with it. ‘Train how you fight’ So when your on the range it’s very important to draw from that purse, back pack or satchel (Indian Jones carried a satchel) and practice. I carry IWB 95% of the time, but there are many scenarios where on-body carry is a challenge. For me, these include going to the golf course, visiting the doctor, or certain business environments that require clothing not conducive to carry. In these situations, I have two favored options – tucking my pistol into the rear zipper of a fanny pack (I don’t wear it around my waist, I shoulder it while moving and set it next to me when stationary) and a holster-equipped rear flap of a Blackhawk laptop bag when in a business environment. To me, the most important things when carrying off-body are to keep it within reach and expand the Yellow-Alert threat zone a bit to provide extra time for action. I can draw from my IWB holster in about 1.5 seconds; it takes about 3 seconds to draw from my fanny pack or laptop bag. If I perceived a potential threat, I would get hands-on with my off-body carry system as early as possible so that I am prepared to draw if needed. An interesting feature of the fanny pack is that I can reach into the compartment and be on-target with my finger near or on the trigger (depending on the threat) while remaining concealed. If needed, I can shoot through the material and actually react quicker than an IWB draw. I carry OWB in a pancake holster at 3:00 consistently with my EDC. I have a little LC9 with extended mag and a Sticky Holster that I call my “swimsuit gun” if my clothing that moment doesn’t have a belt. I also carry a folding knife and tactical pen consistently. I recently bought, off Amazon (less than $20), a one shoulder crossbody pack that is suitable for off body carry but still deciding how best to use it effectively. It has a ton of pockets, molle attachments, paracord webbing and a ventilated back. Off-body carry works for me. I’m a 76-year old male, 5-11, 170 pounds, who likes to wear jeans with a tucked-in tee all the time. I have a handy small black canvas shoulder bag with a rear pocket that holds my snubby in a pocket holster. Being older, I also have 3 pairs of glasses, 2 medicine bottles, a wallet, keys for 2 cars, a passport, my CCW, and other stuff that old folks need in the front pockets. What you have to remember with off-body carry is that you have to go to the gun earlier than someone with on-body carry. No ninja-fast draws with Off-BC. Condition yellow? turn slightly away from the threat, unzip and rummage in your bag for your “keys,” and get a grip on your gun. Michael Bane has a good chapter on Off-BC on his Make Ready DVD. I agree. The off-body carry solution should only be a last resort. Thieves are after that purse, backpack, etc. so one is likely to lose that baggage. More times than not, one is not going to have access to that off-body carry when a sudden attack comes. If one carries on the body, then one will never be unprepared to answer the sudden attack. I always advise folks to conceal carry on their person! We have so many wonderful options for on the body conceal carry, . . . and manufacturers are inventing better products everyday. Thanks for the article giving us food for thought! I never know what to do at the gym?I sweat a lot so a bellyband is out,IF I put it in my gymbag and its in thr locker room then what?I probly couldn’t get to the locker room to get my piece out of my bag fast enough? Kevin, one consideration is to get a smaller gym bag that you can keep with you as you move from machine to machine. Keep a few towels in there, water, and whatever else makes sense. It won’t seem to weird to others but it will require a great deal of habit change. My end of the world, it’s full of thieves and pickpockets and carrying in a bag is just not an option, you blink and its gone! Besides, i always like to feel my firearm at all times if i have to carry. I just cant bring myself to carry off-body and so i have udjusted my lifestyle accordingly. I use different force multipliers.